Hi friends! 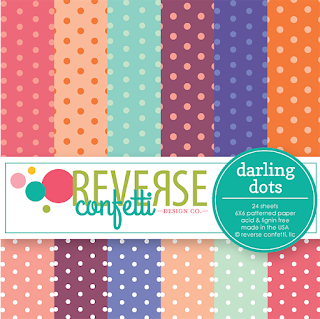 I'm so excited to be joining in the new release celebration with the Reverse Confetti Crew and 'Fetti Friends today. 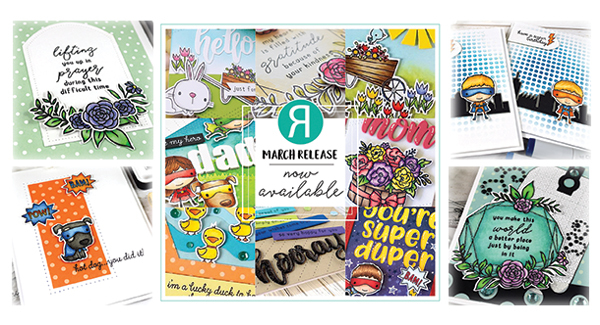 This release is filled with a beautiful mix of whimsy and elegance! All the sets are shipping now, so head on over to the shop to check out all the new goodies. Tomorrow my twins turn 7 (how on earth did that happen??? ), so the So Super set was first on my list to use. 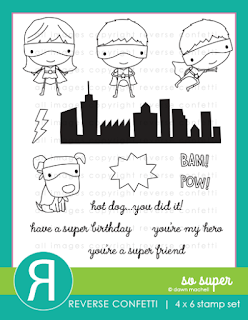 I just knew these adorable little superheroes would make the sweetest birthday cards! I kept things simple because a) they're boys b) they're 7 and only opening the card first because it's expected before you open the present! 😂 and c) there's two of them! The boys love orange and blue, which are the colors of our hometown college team. So I stamped the images in black ink and then colored with Copics and cut with the coordinating So Super Confetti Cuts. I then pulled out the Lotsa Dots stencil and blended across the background with distress inks. 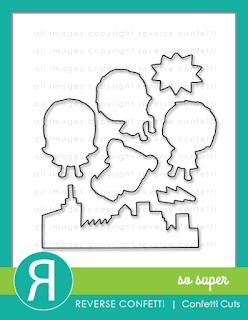 I stamped the city skyline in midnight onto Stormy cardstock, then cut with the die to place behind my superhero. The sentiment is masked off and stamped in two lines to fit inside the Pierced Round Top Layers Confetti Cuts die cut and then I accented with the stamped, cut and colored lightning bolt, jazzed up a bit with some glitter glue. 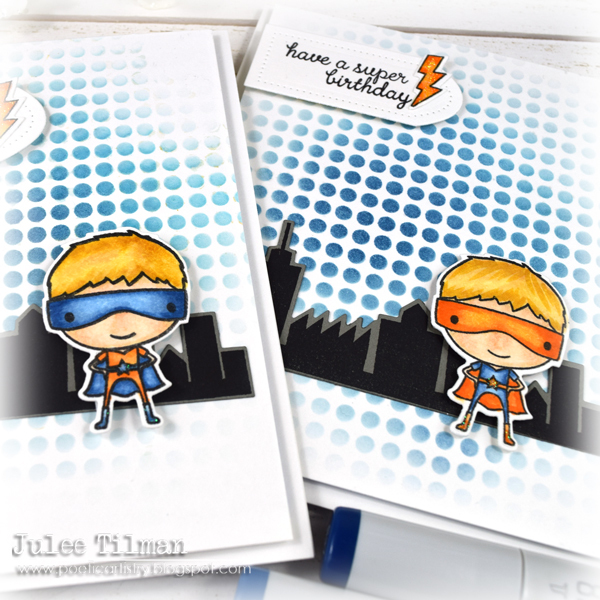 When I was finished, I created a second almost identical card, just swapping the colors of the super disguises. I couldn't ink up this set without using the adorable puppy image. So next I colored him in, adding in a little spot around one of his eyes, and then cut with the coordinating Confetti Cuts. I cut down a sheet of orange polka dot paper from the new Darling Dots 6 x 6 paper pad, then glued it to a white card panel and stamped the hot dog sentiment so it would cross both types of paper. 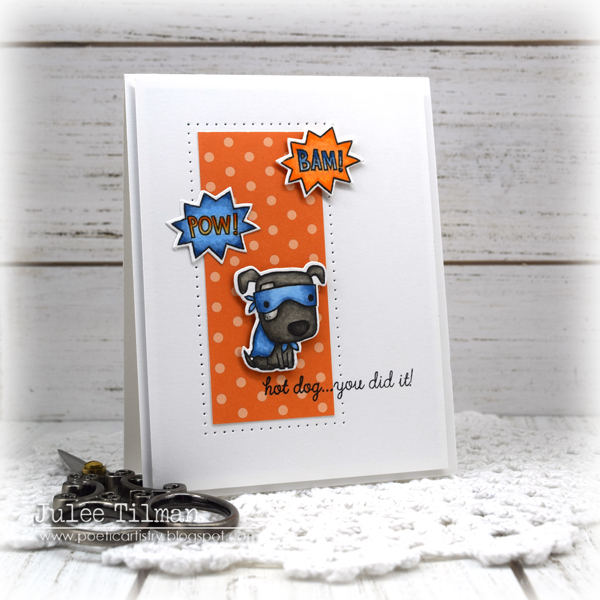 Next I stamped the action bubble two times and added the pow! and bam! words, then colored and die cut to pop up. I felt like the card needed a bit more, so did some pierced dots around the patterned paper layer to finish things off. Another simple card, but I love how it turned out. 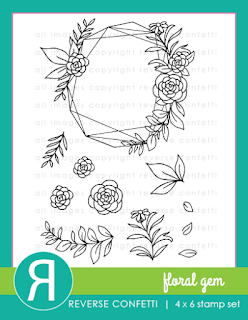 Next, I moved on to the gorgeous Floral Gem set. I just couldn't wait to ink up these beautiful images. And it coordinates with the Sentimental Gems set that has a host of fabulous sentiments that fit inside! Aquamarine was the color that first came to mind. It's my favorite color and also the boys' birthstone, so I started in on coloring the gem image in aqua tones. I had intended it to be a bit lighter, but grabbed the wrong color accidentally when I went to shade in the center portion, so I just rolled with it! 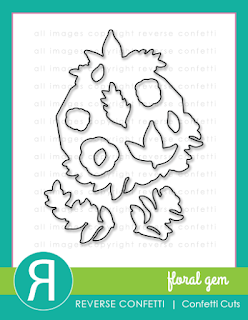 I cut the gem image with the coordinating Floral Gem Confetti Cuts. 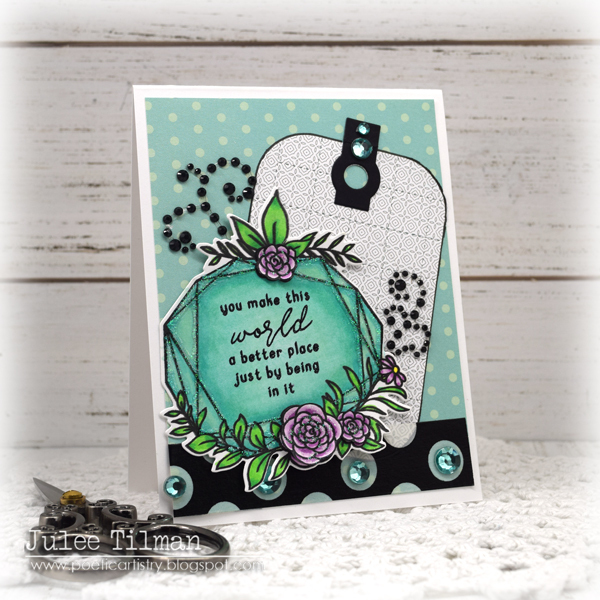 I added the you make this world a better place sentiment from Sentimental Gems to the center. The flowers are stamped separately, colored in purples, and then fussy cut (there are coordinating dies, but I wanted a close cut here) and popped up on foam dots. I added some glitter glue to the flower centers and also to accent all the facets on the gem. For the background of the card, I picked out another pattern from the Darling Dots 6 x 6 pad and then cut the Grid Stitched Tag Confetti Cuts from designer paper from the Free Spirit 6 x 6 pad and midnight cardstock for the hole reinforcer. I layered this on the aqua dot paper, then traced around with a black pen to make it stand out a bit. I added a little Heidi Swapp washi tape to the bottom of the panel, then layered everything together and accented with rhinestones. I unfortunately had need of a couple sympathy cards this week, so decided to tackle one of them for my next card. I stamped the lifting you up in prayer sentiment from Sentimental Gems in black on a white panel cut with the Pierced Round Top Layers Confetti Cuts. Next I stamped all the separate images from the Floral Gem set, colored with Copics and then cut with the coordinating Floral Gem Confetti Cuts. Then it was simply a matter of layering them together and adding to a bit of this gorgeous mint paper from the Darling Dots 6 x 6 pad. Thanks so much for stopping by today! I had so much fun sharing these projects with you. Guess what? There is still so much more inspiration to be found along this hop! Be sure and check out each of these talented artists for their creations with this fabulous new release. Happy Birthday to the boys! WOW, 7 years old already?! 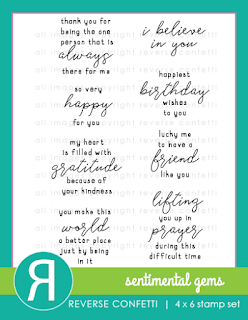 Your birthday cards are adorable and the color combo is perfect. Love how you designed the hot dog one too, so fun! The floral gem cards are gorgeous. Wow, it doesn't seem like the twins are 7 years old. Happy Birthday to them. 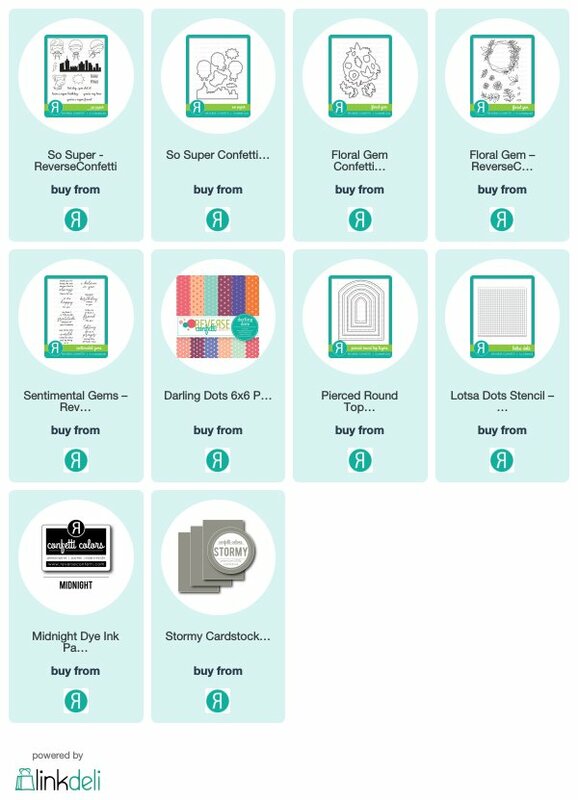 Love all your cards, The super hero cards are adorable and I love the gorgeous cards with the Floral Gem set. Thanks for sharing all your lovely cards. Have a great weekend. mask is fun. Great cards. 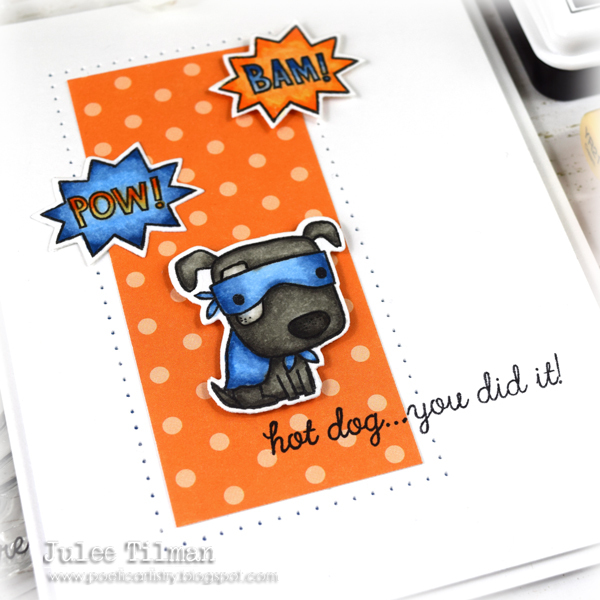 You have used the new RC release products for four wonderful cards, Julee. The first two cards are super cute for kids and the last two are very pretty. Thanks for the inspiration. 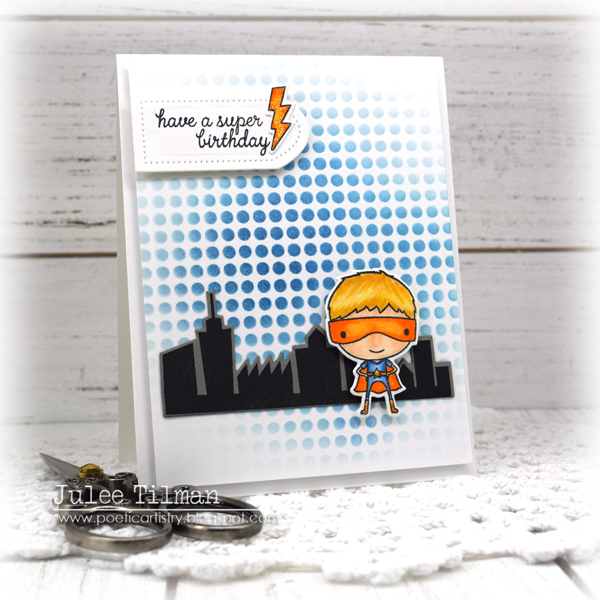 Fabulous cards, Julee! Such a fun variety and your coloring is beautiful as always!